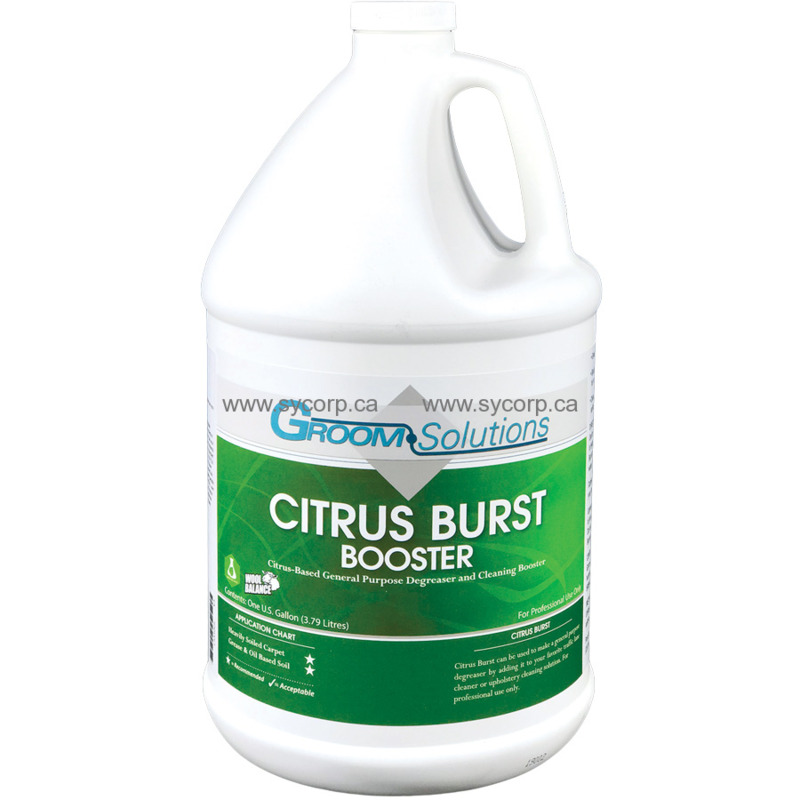 Citrus Burst Booster is a multipurpose cleaning solution boosting agent as well as an extremely effective solvent spotter for use on carpet and upholstery, as well as other textiles and fabrics. Add Citrus Burst to your pre-spray, traffic lane cleaner, carpet extraction detergent, or tile or hard surface cleaning solution to boost cleaning power on tough jobs like oily and greasy soil, motor oil, asphalt track-in, food soil, and many other difficult and grimy soils. Citrus Burst also works great as a cleaning booster and additive for upholstery cleaning solution, and for adding to your favorite degreaser and soot remover in fire restoration work. Citrus Burst is VOC compliant and is safe for warranted stain resistant carpet. As a spotting agent, it works effectively at dissolving and breaking down even the most stubborn grease and oil based spots as well as encrusted chewing gum, wax, tar, paint, oil, grease, cosmetics, cooking oil, ink, dyes, carbon, soot, copier toner, graphite, adhesives and glues, and general oil based spotting. You can also achieve incredible cleaning results by adding Citrus Burst Spotter and Booster as a cleaning booster in traffic lane cleaners. Always Test Surface for Colorfastness Before Application. Traffic lane booster: add 1 to 2 oz. of solution to each gallon of ready to use mixed traffic lane or prespray solution. Tile Cleaning: add 2 ounces of solution to each ready to use mixed gallon of your tile cleaning prespray. In Hydro-Force Sprayer: add 8 oz. per 5 quarts of concentrate. Caution: May damage pumps in extraction equipment.